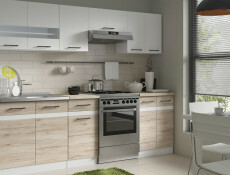 Kitchen Cabinets Sets perfect for DIY kitchens on a budget. 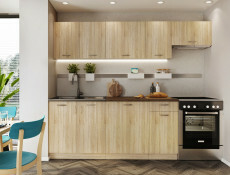 Small kitchen design and ideas. 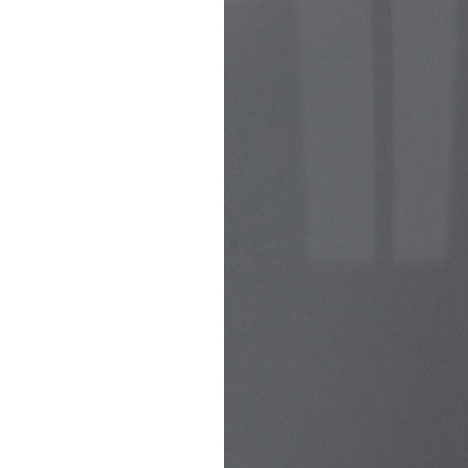 Fast Delivery. 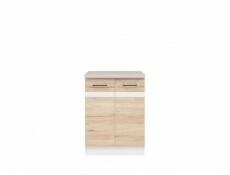 Compact and affordable 5 kitchen cabinets set in Sonoma Oak. 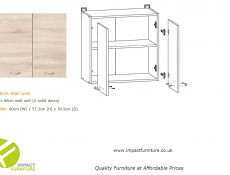 NELA 1 is a small, modern set of furniture perfect for open plan living rooms combined with a small size kitchen. 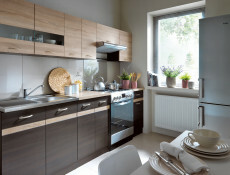 Superb kitchen cabinets or those on a budget. 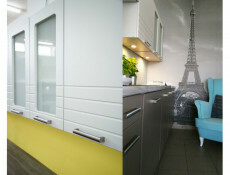 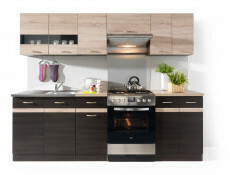 This kitchen furniture sets are also a sensational solution for studios. 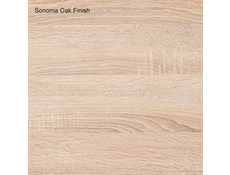 Cabinets and fronts are made of strong and durable laminated chipboard with a thickness of 16 mm in the fashionable and popular Oak Sonoma color. 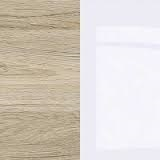 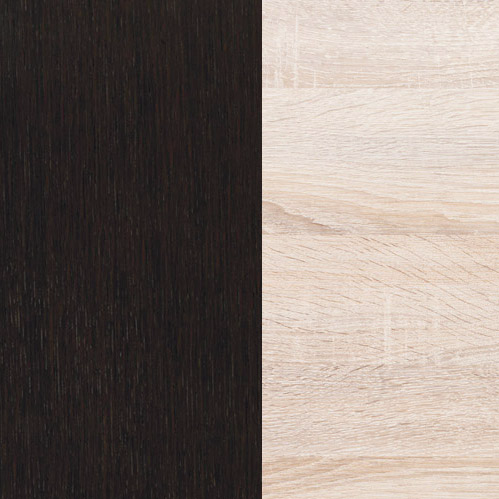 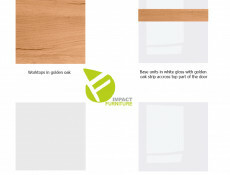 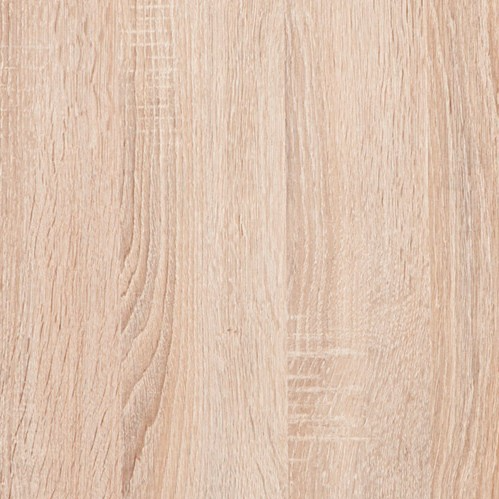 The laminated board is often chosen as a material for kitchen cabinets due to their ease of cleaning, as well as high resistance to greasy stains or high temperatures. 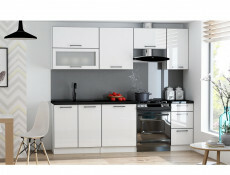 Kitchen Cabinets Set consists of 2 floor standing cabinets and 3 wall hanging cabinets. 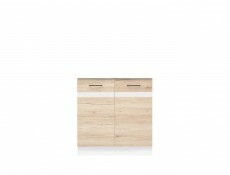 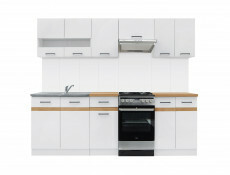 The lower base cabinets include: an 80cm wide sink cabinet (D80ZL) AND a 40cm wide cabinet with a drawer (D40 S / 1 P / L). 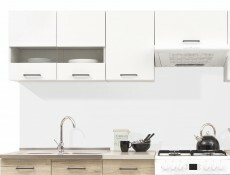 The upper row of wall cabinets consists of a 80cm two-door cabinet (W80 / 56), 40cm 1 door cabinet (W40 / 56), and 60cm extractor housing cabinet (W60OKGR). 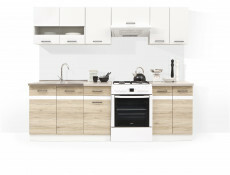 This set does not include worktops for lower cabinets. 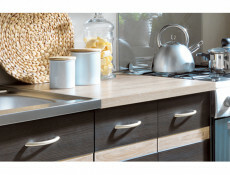 NELA 1 kitchen units are complete with strong plastic easy to clean handles. 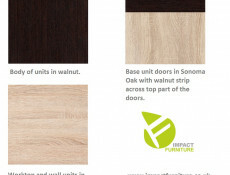 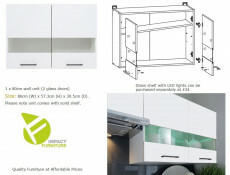 a compact set of kitchen furniture,cabinets made of 16 mm laminated board,cabinet handles made of plastic,metal drawer runners,cabinets sold without worktops,lower cabinets with a total width of 120 cm,upper cabinets with a total width of 180 cm,furniture in a fashionable Sonoma Oak finishAll units are packed together in 2 boxes for home self-assembly.Clear diagram instructions are provided. 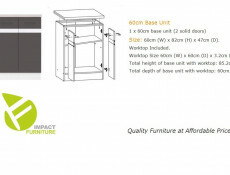 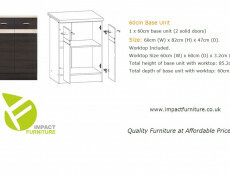 Base units are 820mm tall without worktop. 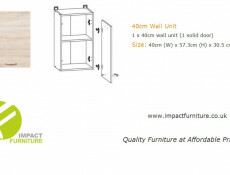 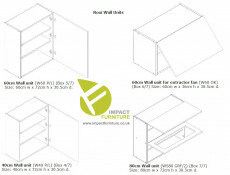 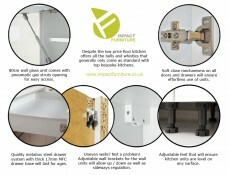 Wall Units are 560mm tall. 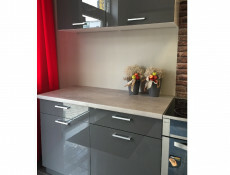 After adding the worktop and moving the cabinets away from the wall, the depth of the cabinets together with the worktop is 60 cm. 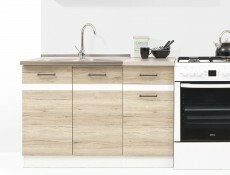 Worktop not included. 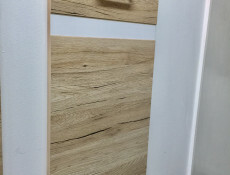 Customer can use their own worktops. 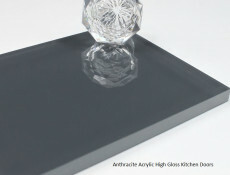 Total depth of 60cm will be achieved for base units once standard 60cm deep worktop is mounted. 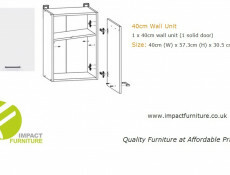 Installation tip: During installation units need to be brought away from the wall by 12cm leaving 12cm service gap at the back. 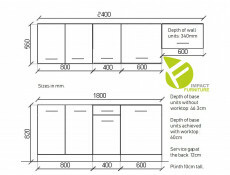 Total length of all units when put in a straight line is 240cm. 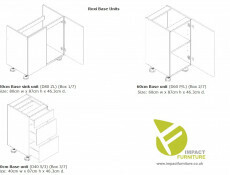 Units are freestanding and do not have to be placed in a straight line. 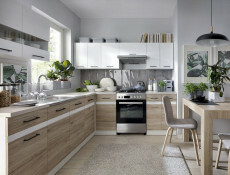 Designer Scandinavian style DIY kitchen. 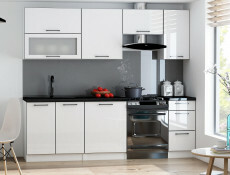 White High Gloss kitchen cabinets cupboards units with black accents are sold as a set. 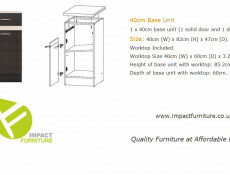 Those quality and affordable units are also available individually. 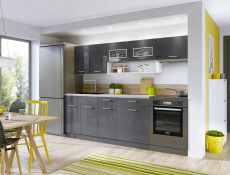 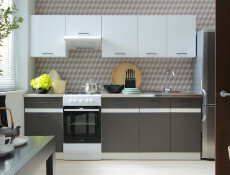 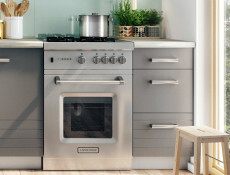 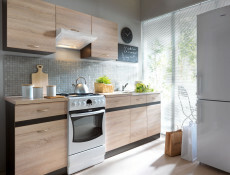 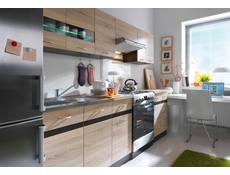 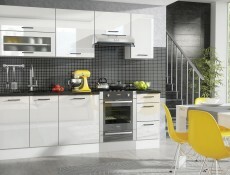 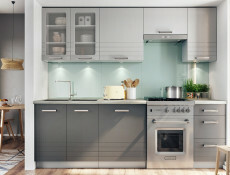 Roxi kitchen furniture offers high end spec kitchen units with affordable price tag. 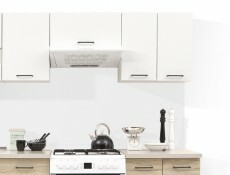 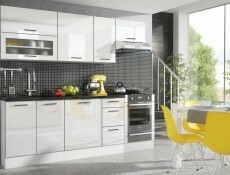 Roxi kitchen cabinets are a stylish option for any kitchen. 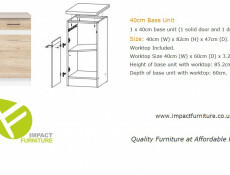 Total length of the set is 240cm and all units including base sink unit and wall glass unit can be positioned separately and not necessarily in a line as shown on the photo. 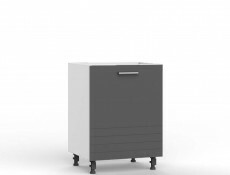 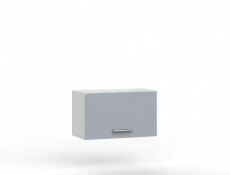 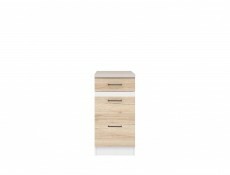 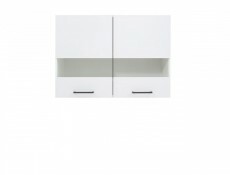 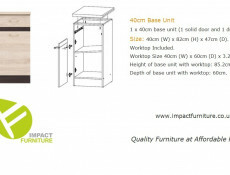 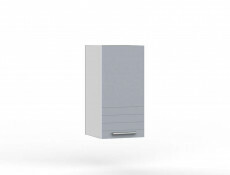 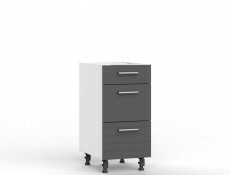 3 Base units:1 x 40cm Base unit (D40 S/3) with 3 drawers 40cm wide x 87cm high x 46.3cm deep. 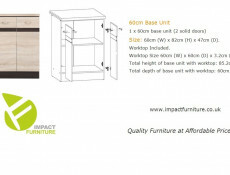 (Box 3/7)Worktop not included. 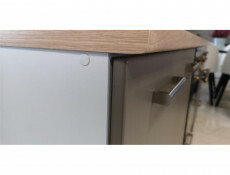 Customer can mount their own worktop. 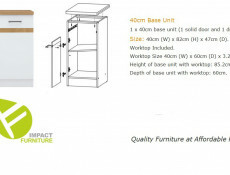 Total depth of 60cm will be achieved once 60cm worktop is mounted. 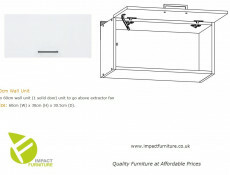 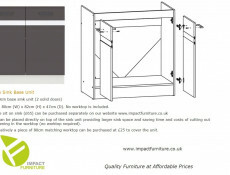 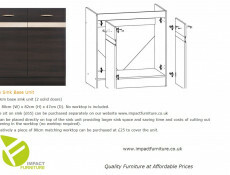 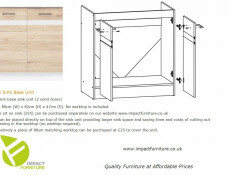 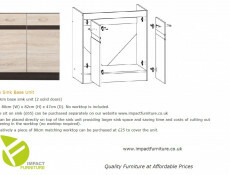 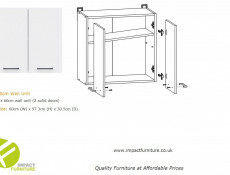 1 x 60cm Base unit (D60 P/L) with one solid door 60cm wide x 87cm high x 46.3cm deep. 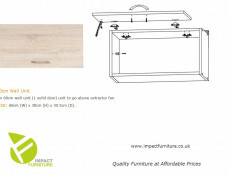 (Box 2/7)Worktop not included. 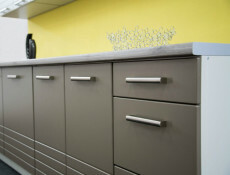 Customer can mount their own worktop. 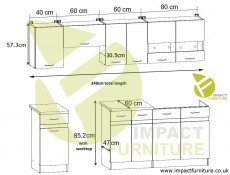 Total depth of 60cm will be achieved once 60cm worktop is mounted. 1 x 80cm Base sink unit (D80 ZL) with two solid doors 80cm wide x 87cm high x 46.3cm deep. 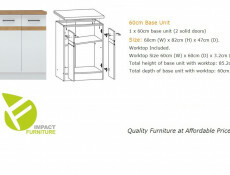 (Box 1/7)Worktop not included. 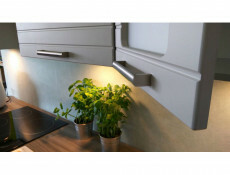 Customer can mount their own worktop. 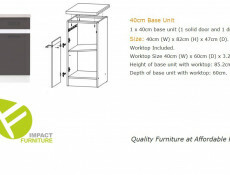 Total depth of 60cm will be achieved once 60cm worktop is mounted. 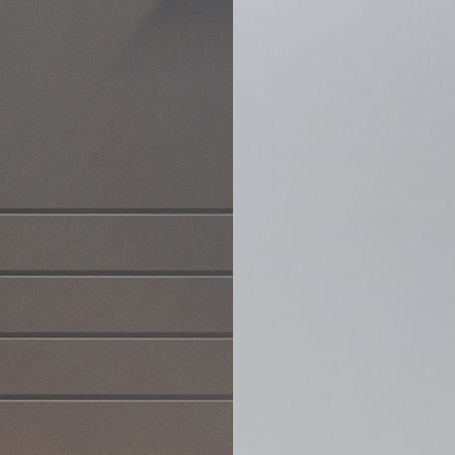 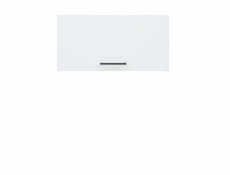 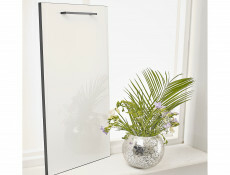 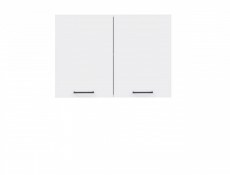 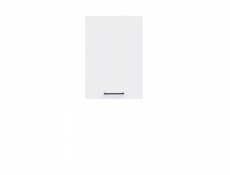 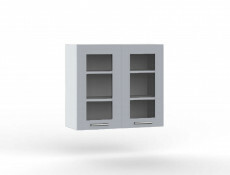 White gloss end panels for Roxi base units are available to purchase separately. 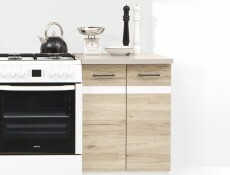 This kitchen set is ideal to be used with a 60cm wide freestanding cooker. 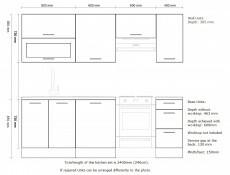 Total length of all units when put in a straight line is 240cm including a cooker 60cm space. 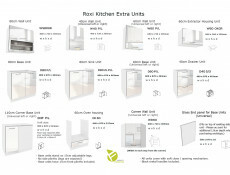 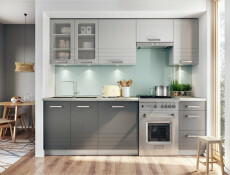 Modern and functional kitchen cabinets, complete 7 unit kitchen furniture set from Roxi range covering a space of 240cm. 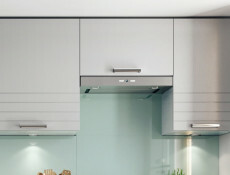 Beautiful Modern Luxe kitchen cabinets set in Anthracite Acrylic High Gloss finish. 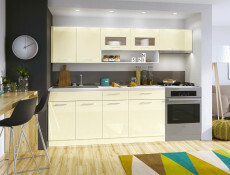 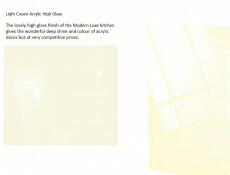 The lovely high gloss finish has a wonderful deep shine and colour that is characteristic of acrylic doors. 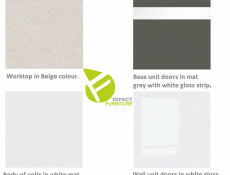 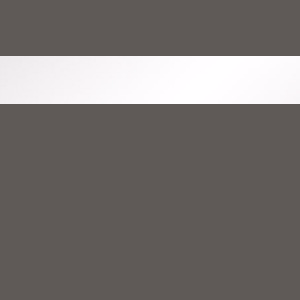 This dark shade of grey is rare in colour but very versatile in use and easily fits into many interior styles. 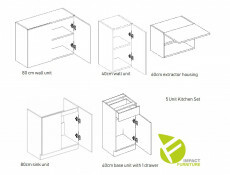 Compact and affordable 7 kitchen cabinets set in Sonoma Oak. 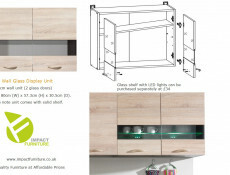 NELA 2 is a small, modern set of furniture perfect for open plan living rooms combined with a small size kitchen. 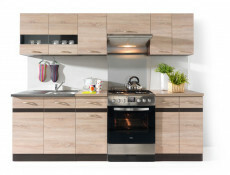 Superb kitchen cabinets or those on a budget. 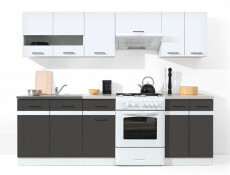 Kitchen Cabinets Set consists of 3 floor standing cabinets and 4 wall hanging cabinets. 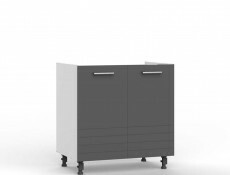 The lower base cabinets include: an 80cm wide sink cabinet (D80ZL) , a 40cm wide cabinet with a drawer (D40 S / 1 P / L) and a 60cm wide cabinet with 1 door (D60 P / L). 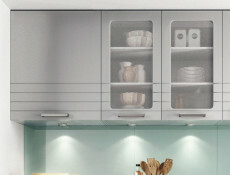 The upper row of wall cabinets consists of a 80cm two-door cabinet (W80 / 56), 40cm 1 door cabinet (W40 / 56), 60cm 1 door cabinet (W60 / 56 P / L) and 60cm extractor housing cabinet (W60OKGR). 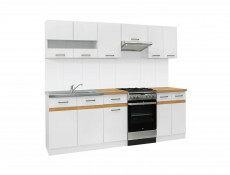 This set now includes worktops for lower cabinets. 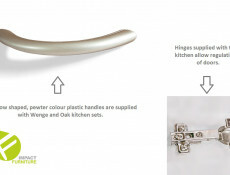 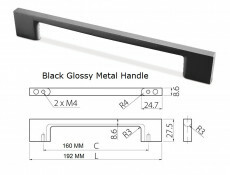 NELA 2 kitchen units are complete with strong plastic easy to clean handles. 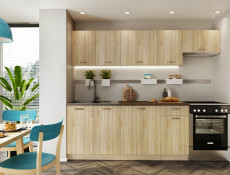 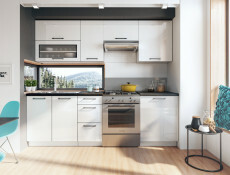 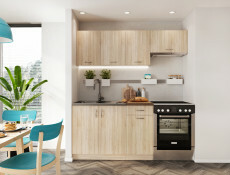 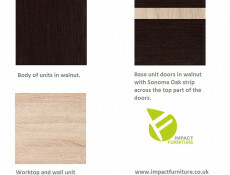 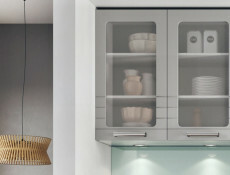 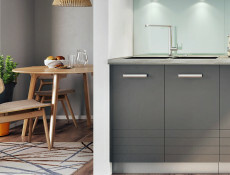 a compact set of kitchen furniture,cabinets made of 16 mm laminated board,cabinet handles made of plastic,metal drawer runners,cabinets sold without worktops,lower cabinets with a total width of 180 cm,upper cabinets with a total width of 240 cm,furniture in a fashionable Sonoma Oak finishAll units are packed together in 3 boxes for home self-assembly.Clear diagram instructions are provided. 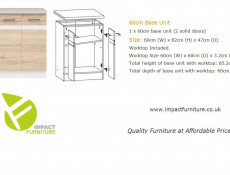 Base units are 820mm tall without worktop. 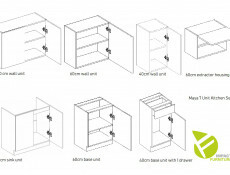 Wall Units are 560mm tall. 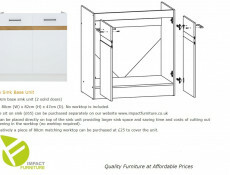 Worktop now included. 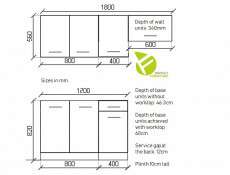 Total depth of 60cm will be achieved for base units once standard 60cm deep worktop is mounted. 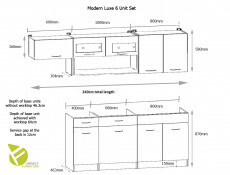 Modern and functional Light Grey kitchen cabinets, complete 7 unit kitchen furniture set from Paula range covering a space of 240cm. External wall unit depth without the door is 28.8 cm. 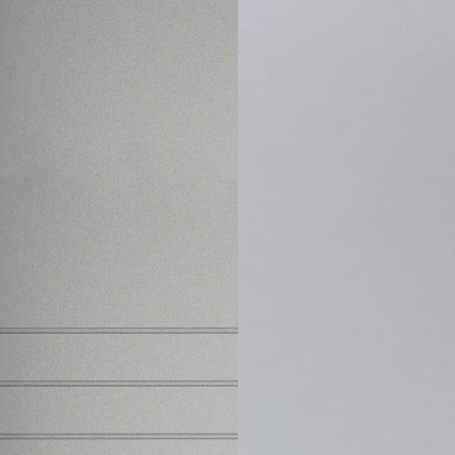 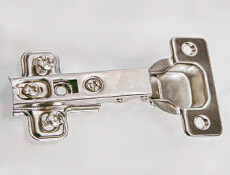 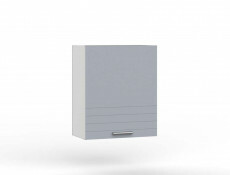 Door depth is 17 mm, making total external depth of wall units at 30.5 cm.